The variety and flexibility gives unlimited solutions to meeting homeowners needs. Savvy homebuyers can create their dream home that meets their needs for years of comfort and enjoyment. Homeowners can leverage their equity and future value to meet the changing living needs. We've compiled the following categories to illustrate the flexibility of renovations loans. Think of all the needs that adds curb appeal inside & out. From worn flooring to outdated kitchen & bathrooms, renovation loans can dramatically and affordably transform your home with finished improvements to enjoy for years to come. ​Finished improvements adds new fresh appeal. Close escrow and go shopping! Be your own "flipper" to select your finishes that matches your tastes and lifestyle to enjoy years to come. Home maintenance may elude homeowners. Some building components may be beyond their useful life. Costs of replacement of many of these major components are costly and consequently become deferred. Deferred conditions will lead to damage to other building components and become hazardous. Renovation loans primary intent is to make every home safe and create a healthy environment. Make your home safe & livable. Leverage renovation loans to take care of finished improvements and deferred conditions. Add that much needed master suite, bedroom, bath & closet. Renovation loans allows addition of added square footage for any needs. Create that dream kitchen. These additions has been popular for refinance. This is ideal when moving is not an option or desire. ​It also increases the value of your home. Add that pride-of-ownership to share with family and friends for years to come. Home ownership is the foundation of building equity. Real estate investment is a proven strategy for creating long term wealth. ​Renovation loans can take you to the next level of building equity, income and wealth. Renovation allows addition of income properties. You can add up to 3 more properties. When it comes to financing, renovation loans offers the lowest rate. 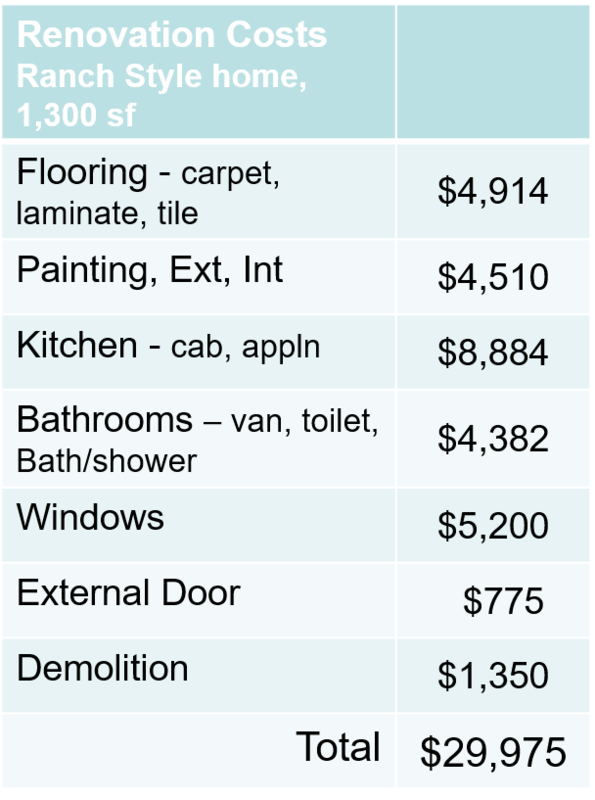 New construction costs versus appraised value. Financing - Renovation loans are offered at the same rate as your home loan. These loans offers the lowest of borrowing money period. Standard construction or hard money loans interest rate can be almost double. The one drawback with these loans from HUD and Fannie Mae, is that they will require PMI (Private Mortgage Insurance) in most circumstances. Monitor your equity. 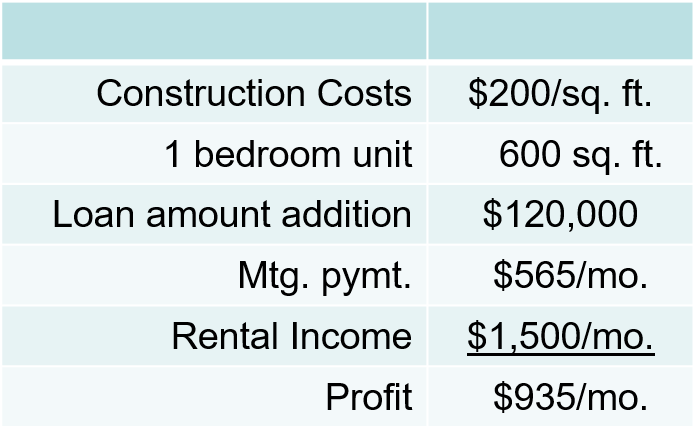 Construction Costs - Realize that since you already own the loan on detached home, you just need to determine new construction costs. At this time in the San Diego area, new construction costs for rental grade of finished improvements range between $150 to $200 per square foot. Now compare the current market conditions of appraised value. Appraised value can be multiple times higher compared to new construction costs. Recurring Rental Income - San Diego county has been experiencing a shortage of rental properties. No relief in sight. This scarcity if putting upward pricing on monthly rental. The average for 1 bedroom/1 bath by numerous sources today is averaging around $1,500.00/mo. As 600 sq. ft. addition as rental property will add approximately $575.00/mo to your mortgage to create and attractive profit of $935.00/mo. Another great to create your dream home, value and equity is to consider looking at homes that are uninhabitable. These can be foreclosed properties, abandoned properties or homes of severe neglect. Let's look at how you can maximize these properties. Purchase at a discount - As these homes need immediate renovations to make it habitable, many to look elsewhere. Lenders won't lend on homes that are not habitable. Most sellers and appraisers recognize these properties must be offered at a discount. You will compete with investors paying cash. They're savvy and need to incorporate a profit margin that will only pencil-out offering at a higher discount. There should be room for the savvy buyer with a renovation loan. Remember many sellers would prefer to sell to a home buyer versus an investor. Create to your specific tastes, top to bottom - As the home requires major renovations, creates the opportunity to make all improvement to your specific tastes to enjoy for years to come. Go shopping for flooring, painting, cabinets and more. Can create immediate equity - One of the requirements of the renovation loans is the appraiser is responsible to determine the value of the property based on all of the improvements. As the property was purchased at a discount, the appraised value will be determined on all improvements. Renovation loans encourage sustainability. From affordable weatherization improvements to renewables, renovation loans offers financing in energy efficiency & renewables for all the right reasons. Energy efficiency and solar can be cost-effective. Unlike that kitchen or bathroom remodel these improvements can pay for themselves in under 10 years or less. One of the reasons, is that Southern Calif energy utilities are the highest ​in the US. These loans can used with with Energy Efficiency Mortgages (EEM) that allows increase of loan amount for energy efficient improvements that are cost effective. You can even add renewables like solar or wind. Energy Efficiency - Older homes may lack insulation, single pane windows, energy-hog appliances. These can lead to higher energy utility costs and comfort issues. Renovations loans require minimum weatherization improvements like weather-stripping and caulking. This is a great opportunity to have your property evaluated for its energy efficiency. ​Renewables - Solar & wind can be included in renovation loans. They can have a great ROI, tax incentives make this an attractive way of driving down your monthly costs when you now reduce your home energy & transportation fuel costs. Financing - Energy Efficient Mortgage (EEMs) can be included that allows higher loan qualification when you include energy efficiency improvements like insulation, dual pane windows, tankless water heater and more. Rebates/Incentives - Take advantage of other rebates and incentives that reduces your costs of becoming more sustainable. Local utilities, lenders and realtor associations offers rebate. Research your utility provider, realtor, and lender. We also track many of these incentives. Give us a call.